MOSCOW, August 2. /TASS/. Russia and India may hold two launches of BrahMos cruise missiles from a Sukhoi Su-30MKI fighter jet against sea and ground targets at the end of this year, the CEO of Russia’s Research and Production Association of Machine-Building told TASS on Tuesday. “If positive results of the work with the technologically operational missile are received, there are plans to carry out demonstration launches of two organic missiles against a sea and a ground target,” CEO of the Research and Production Association of Machine-Building Alexander Leonov said. “After fulfilling the program of flights to get operational performance readings, the so-called emergency release of the mock-up is planned to get data on the dynamics of the missile’s safe separation from the aircraft,” Leonov said. Russian-Indian joint venture BrahMos Aerospace Limited is going to test a Su-30 MKI fighter jet equipped with a BrahMos supersonic cruise missile in fall. 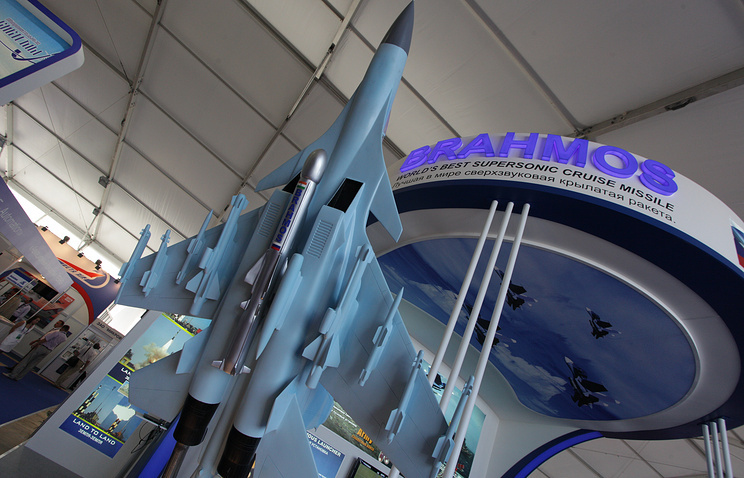 Russian-Indian joint venture BrahMos Aerospace Limited is going to test a Su-30 MKI fighter jet equipped with a BrahMos supersonic cruise missile in fall, the company’s spokesman Praveen Pathak told Russian media. “In September-October we are going to hold the first practical air launch of the missile. We have already completed 90 percent of works on the complex. Our military are inspired by fire power and range capability, which will be provided by the deadly combination of the most progressive fighter and our missile,” Pathak told the Izvestiya newspaper. He added that in order to equip the fighter with the BrahMos missile, it was necessary to make changes in the jet’s design. The company carried out a demonstration of a Su-30 MKI fighter equipped with a BrahMos missile on June 25. 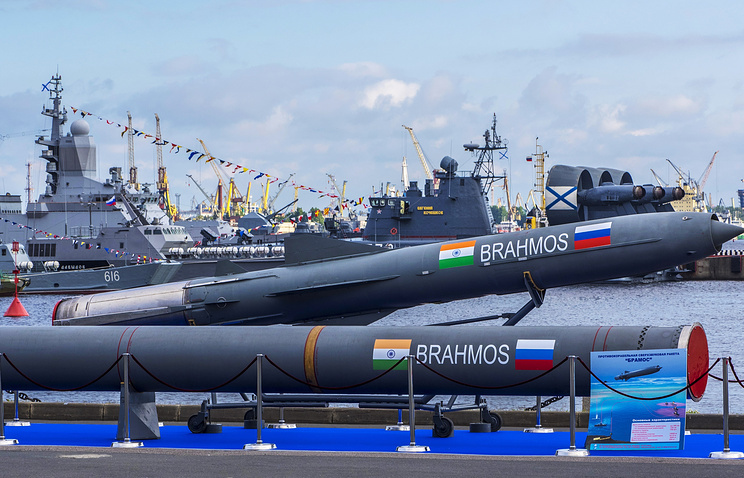 India and Russia have agreed ‘in principle’ to export the world’s fastest anti-ship cruise missile, BrahMos, to third countries – the UAE, Vietnam, South Africa and Chile, Praveen Pathak, spokesman for BrahMos Aerospace – the developer of the missile, told TASS on Friday. “The several structural changes were made in the defence exports policy and these were yielding results. As far as the BrahMos missile is concerned, talks with countries like UAE, Chile, South Africa and Vietnam are in advanced stages,” he said. “Since Russia is the partner country in the BrahMos joint venture with its consent discussions with several other countries, including Philippines, South Korea, Algeria, Greece, Malaysia, Thailand, Egypt, Singapore, Venezuela and Bulgaria have now been taken to the next level,” he said. “In the case of Vietnam, China has expressed its reservations against India’s policies to supply weapons. In the South China Sea, China and Vietnam are locked in a conflict over maritime boundaries. We expect that those friendly nations with whom neither India nor Russia have any conflict would be keen on buying these missiles,” he said. An Asian-Pacific country will sign a contract on the delivery of Russian-Indian BrahMos cruise missiles by the end of 2016. KUALA LUMPUR The first export contract on delivering Russian-Indian BrahMos cruise missiles to a country in the Asian-Pacific Region will be signed by the end of 2016, BrahMos Aerospace spokesman Praveen Pathak said Wednesday. “It’s too early to be specific since negotiations are continuing, but we plan that by the end this year there will be one solid contract,” Pathak told RIA Novosti in an interview. He added that the Asian-Pacific nation would be a friendly nation that neither Russia nor India has any conflicts with. The first trials of the Russian-Indian BrahMos cruise missiles on Russian Su-30 Flanker C multirole fighter jets will begin in one or two months and end in November-December 2016, Praveen Pathak said.”Ground tests of the aircraft missile have ended, now we’re planning to place it on an Su-30 and in the next month or two there will be trial launches,” Pathak told RIA Novosti. He said that a life-sized rocket mock-up would be initially used in the tests, and then proceed with an actual BrahMos cruise missile. “We hope that all of the tests will be complete in November-December,” Pathak added.